-- Select a Size -- 6"-10" 10"-16" - Out of Stock! 14"-20" 18"-26"
Add some classic style to your dog's day with the Zack & Zoey Nylon Dog Collar in Jet Black! Our Zack & Zoey Nylon Dog Collar in Jet Black is a durable and fashionable basic but this black is anything but boring! 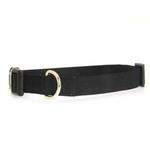 This classic black collar won't detract from your dog's natural good looks. This nylon collar may be value priced, but make no mistake - this collar will last a long time! The sturdy nylon is strong and is machine washable should your pooch decide to frolic through puddles. This collar is available in a wide range of sizes to suit most any pet. It's perfect for growing puppies with its wide amount of adjustability. Black is a classic style that looks great on a wide variety of coat colors and won't clash with any of your pet's attire. 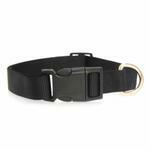 Each dog collar features a matching plastic quick-release buckle and a nickel-plated D-ring for leash attachment. The durable nylon will be a lasting look that your pup's admirers will love. Nylon Dog Collar by Zack & Zoey - Jet Black Customer Photos - Send us your photo! He is such a well behaved dog, and the ball is his friend. He rides on my Harley with me and loves it. Likes to Stay warm and Cozy. Ziggy is celebrating her first birthday today and has her beautiful dress on with all colored ribbons and a birthday girl pin. She received new toys today and will get a special dinner tonight. She also shared her birthday with many friends in our retirement park today handing out goodie bone bags. Buster is proud to wear his BaxterBoo collar. Nice collar for a great price!! Needed a fresh collar for my foster pup. This one was priced right, made well and looks good! Thanks BaxterBoo!!! This simple collar is lightweight and easy to put tags on. It washes well and we have several in a variety of colors. The price is great, too. Posted On 05/17/17 by Rebecca H from Weston, MA Yes, Rebecca H recommends this product! I have four teacup shih tzus and I like these because they are thin, lightweight, and easy off and on when groomed. These collars are simple and small. They work well with our Boomerang Tags. Posted On 02/05/15 by Danielle C from , Yes, Danielle C recommends this product! I was looking for something on the cheaper side for all my foster dogs. These collars are perfect! This is a good basic collar - good value for the price. I bought it in several colors to use with bandannas that slip over the collar. Always satisfied with products we have ordered and every order is delivered promptly. Like how they offer a coupon toward the next order.